I would really like ALL members input please! It has been brought to my attention that the site is not as "professional" and as nicely designed as other sites. logo and colors is all that would change not the layout. I do agree it could be better since i have designed everything and well im not a graphic designer! plus if it is designed better, i think it might bring more members that won't think the site is . Does anyone on here have input for design or ideas? Even a completely different look i am open to as well. No hard feelings at all,so please feel free to leave comments of all kinds. Re: I would really like ALL members input please! I love this website just the way it is. It is very easy to navigate. I dont want anything to change. no, navigation would be the same but logo and colors is what i mean. glad you love it though because that is definately what i love to hear! You can't change the logo!! It fits the name so well! Maybe add the reviews and giveaways (some how) in the Hop on board for samples,etc. I also Love the site,it is a very great interactive site. ya know there are web designers out there that will do it for you for FREE in exchange for a review/promotion of their profession. i will try to search on that tomorrow if you're interested. for now...OCEAN signing off...ttyl ladies! ocean i would love that!!! cin i completely agree!! It would definately on the same line as what we have since i love the idea and hop on board and caboose rider,etc... just a sharper design that looks more professional but still geared to a train with samples...unless someone can totally blow me out of the water with another great idea. 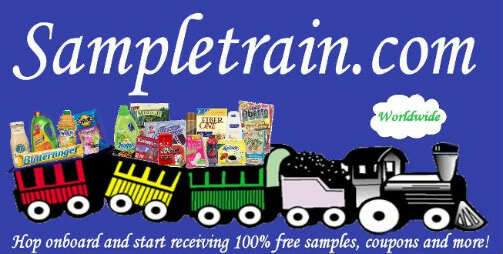 your logo though is perfect its what it is "sample train"
why would you want to change it. Honest i think its perfect the way it is. Look around at other sites that offer freebies most just have a square logo with the name in it. I think yours if much more original once again my thought. ya i think they're pretty dumb too. the logo would be relatively the same (if i change it) to where the theme of it would still be a sample train...it only makes sense to keep it since it is how we got the idea for the name! just maybe have it professionally done so it doesn't look all botched and low resolution. It's to bad the people who comment about it looking unprofessional don't say what you can do to change it. It would be nice to get suggestions from them too. Why do they think that and what can we do to fix that......you know, from the mouths of the beholders. Laura wrote: ocean i would love that!!! I like this look, too. There are lots of blogs out there that have so much on the sidecars that it is hard to read through. I am going to send you a couple of names by PM that I have seen on other sites that don't charge much to do web designs if you are set on changing it & having a pro do it! That should say sidebars...stupid auto-correct! thanks! I'm just looking around to see what they would charge to basically do what it is already but sharper and higher resolution and maybe offer some suggestions. I love it the way it is. You shouldn't change it if some people think its a site, which is ridiculous. You are doing a great job on here and you did a great job on the logo.